Autumn in London can seem a cold and dreary place, but there is sunshine in the vegetable aisle as some of my favorite vegetables are starting to come into season. Cabbage, cauliflower, kale, and butternut squash are slowly overtaking last month’s peppers and tomatoes, and I am armed with plenty of good reasons to warm up the house with a hot oven. Roasted winter vegetables are one of my favorite things. Winter blues be gone – bring on the comfort food. Last night, I made my first foray into Morrocan cuisine with a tagine recipe I found on BBC Good Food. A tagine is a type of conical clay pot used in Moroccan cuisine to make slow-cooked stews. 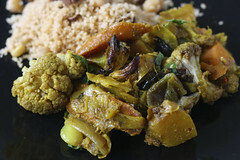 This particular stew consists of mixed vegetables, onions and prunes in a chermoula marinade consisting of onion, garlic, ginger, lemon juice and spices. For lack of a traditional tagine pot, I made do with a Chasseur covered casserole which seemed to do the trick. The chermoula is amazing – I bet it would be a tasty marinade for tofu. The prunes were also a great addition, though other dried fruits like apricots or figs would probably work as well. 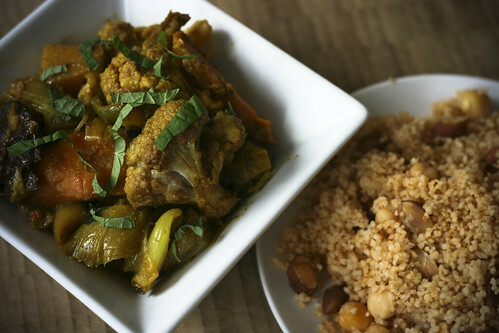 I love that this tagine can pretty much be made with whatever vegetables are handy. The original recipe called for potatoes and parsnips, but I used cauliflower and butternut squash, in addition to carrots, leeks, and red onion. 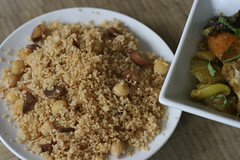 I served this with almond and chickpea couscous. As far as “complete meals” go, this one’s pretty solid: beans, grains, and way more than your five-a-day. I bet this is the kind of dish that tastes even better the next day (I will find out tonight when I eat what little tagine is leftover). 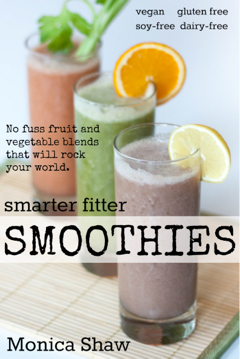 You can use whatever veggies you have handy for this. If you don’t have prunes, you could also try dried apricots or figs. Pre-heat oven to 220 C / 430 F.
To make the chermoula, whizz paste ingredients in a blender. Combine the olive oil and vegetables in an oven-proof casserole and cook on the stove until lightly browned, about 7 minutes. Add the chermoula paste to the casserole, along with the prunes. Pour in 400 ml water, cover with a lid and cook in the oven for 45 minutes. Reduce heat to 180 C/ 350 F and cook for another 45 minutes. Sprinkle with mint. 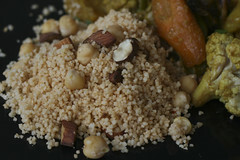 Serve with almond and chickpea couscous (see below). Pour 400ml boiling water over the couscous in a bowl, then stir in the harissa with 1/4 tsp salt. Add the chickpeas, then cover and leave for 5 mins. Fluff up with a fork and serve with the tagine, flaked almonds and extra mint. Sounds delicious! I’ll definitely be trying it in the next few weeks. I just picked the last of the kale from our garden last night and cooked it up fresh out of the ground. Simple yet delicious. I steamed it lightly then quickly sautéed it in some organic butter, salt and pepper. Yum! Adam, let me know how it goes! Your kale technique is very similar to my own. I sometimes add onion and/or garlic, as well. As you say, simple but delicious! Mmmmmmm. A tagine would exactly hit the spot right now, but I’m traveling. I think I need to google for Moroccan restaurants around here. . . . Does Chermula not have cumin in it? May, thank you for alerting me to the omission! You are correct! I’ve corrected the recipe above.